The 20th century Takfiri movements are a by-product of the Marxist, Socialist, Leninist ideologies that were distilling in the minds of individuals like Sayyid Qutb (see here) and Taqi al-Din al-Nabahani (see here). Taking the concept of revolution (ideological and physical) as a means of establishing social justice was a theme incorporated into the writings of ignorant 20th century thinkers, the most prominent amongst them being Hassan al-Banna, Abu Alaa Mawdudi, Sayyid Qutb and Taqi al-Din al-Nabahani. This created the framework that gave birth to the Kharijite ideology of Takfir and khurooj. These are the true and real origins of the Takfiri movements of the 20th century. However, over the decades, and as the Salafi scholars exposed them, their figureheads and their doctrines, they have attempted to resemble the Salafis more and more as a means of veiling their falsehood. It is authentically narrated from the Messenger (sallallaahu alayhi wasallam) that the Kharijites are (سفهاء الأحلام) which can be loosely translated as "foolish-minded." The earlier and first Kharijites were of course in a much better situation than the contemporary Kharijites because the contemporaries do not consider lying to be a great deal whereas the Kharijites of old, out of their exaggerated piety, wrongly believed it would make them disbelievers and feared it a great deal. On this count and many others, there is no comparison between the earlier and modern Kharijites. There are remnants of the followers of Hizb ut-Tahrir who have resorted to various labels after the Muslims became aware of their group and its devious methodology, and over the past few years they have hijacked the Salafi label, wrongly thinking it will veil their bid'ah and dalaalah which they procaim openly. They cannot name a single Salafi scholar who is upon their way in this time and this is because they have no scholars, they only have the likes of Abu Hamzah al-Misree (who has recently revealed his connections and dealings with MI5 in his court case in the US as part of his defence argument!) - and those like him from the straying ignoramuses. In the UK, such foolish-minded youths are operating under the label of (so-called) Salafi Media UK, and we will look at some of their main speakers in thi series. Note: The word retard in its dictionary meaning that is being used here, refers to "a foolish person", one who is "stupid, ineffective" and is similar to the word (غبي) in Arabic, which means, "stupid, ignorant, silly" and what is similar to that. Use of word (غبي) can be found in the speech of some of the Scholars to refer to disparaged individuals deserving of the label. 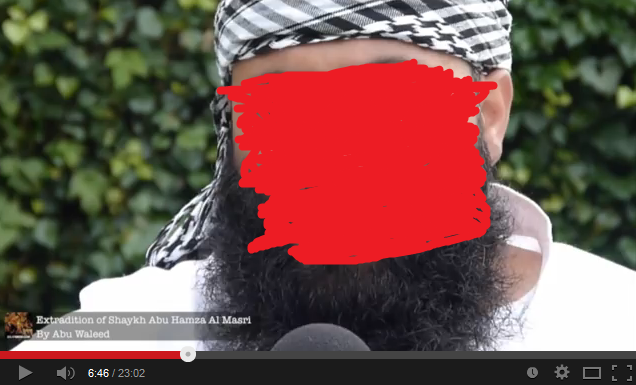 Takfiri Retard: Allaah's Alleged Name "al-Haaliq"
In the video below Abu Waleed (of the so-called "Salafi Media UK" or "SMUK") mentions what he believes to be a name of Allaah, the Exalted. The name (الحالق) means "the Shaver" - we seek refuge in Allaah from such ignorance - the Kharijites of old were ignorant, but they were not this ignorant. It is this very grade of retard that makes takfir of the Salafi scholars of our time! It is one thing to be misguided, but it is another thing to be made a display of humiliation in that misguidance. The Prophet (sallallaahu alayhi wasallam) described one of the traits of these people as "they speak with the best speech of creation" and much of what they say (Allaah's law etc.) is received by many as being lofty and noble speech, yet alongside that, the manner of the Prophet (sallallaahu alayhi wasallam) in addressing them was to refer to them as (كلاب النار), "dogs of hellfire." Their ignorance (jahl) coupled by extreme fervor and absence of scholars amongst them leads them to misguidance (of themselves and others) and they bring about harm and destruction in numerous ways.